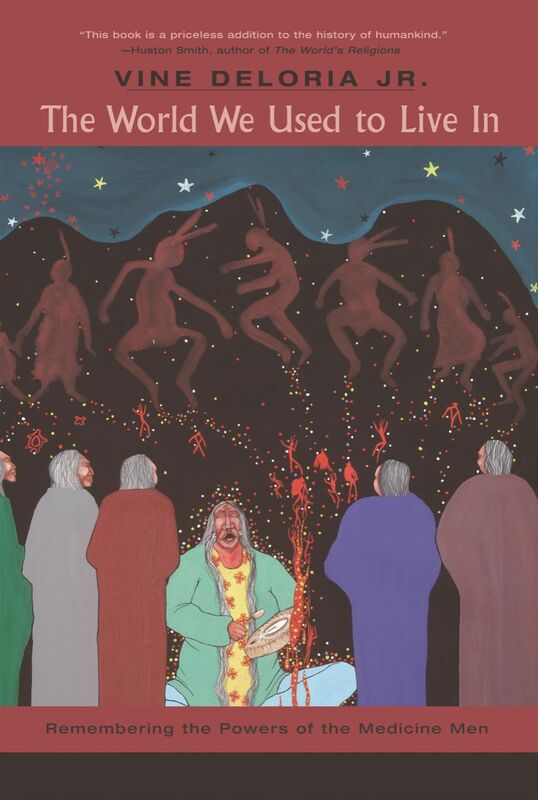 The cover of "The World We Used to Live In: Remembering the Powers of the Medicine Men," written by South Dakota native and renowned author and scholar Vine Deloria Jr. Through the use of modern technology, the traditional way of indigenous thinkers getting their message out is being brought to new life. Indigenous Audiobooks, which focuses on works by contemporary indigenous writers, put out its first digital-download audiobook in December. Bridger, the producer of the project, said the art form and technology fits with indigenous tradition. “Most indigenous history and thought is perpetuated in the form of oral history anyway, and I see this as kind of an ironic return to that format,” Bridger said in a phone interview with Compass. The company’s first book out of the gate is filled with western South Dakota ties, starting with the author. “The World We Used to Live In: Remembering the Powers of the Medicine Men” was written by South Dakota native and renowned scholar and author Vine Deloria Jr. According to a Nov. 14, 2005 Journal article, he was born in Martin in 1933, was a member of the Standing Rock Sioux Tribe, got a master’s in theology from the Lutheran School of Theology in Rock Island, Illinois, and earned his law degree in 1970 from the University of Colorado, where he later taught. Deloria’s work in the 1960s as president of the National Congress of American Indians was cited for uniting American tribes to push the federal government for improved treatment and treaty rights by Patricia Limerick, faculty chairwoman of the University of Colorado’s Center of the American West. Deloria went on to write more than 20 books, with the acclaimed “Custer Died for Your Sins: An Indian Manifesto” among them. His biography on the University of Colorado Law School’s website says Time magazine considered Deloria one of Christian faith and theology’s “primary movers and shakers” after his book “God Is Red: A Native View of Religion” came out in 1974. Deloria died Nov. 14, 2005, in Golden, Colorado, and received a lengthy obituary in the New York Times. Deloria’s background and influence alone made one of his works a good choice for the project’s first audiobook. But it was a personal connection that truly brought it home. Bridger is a musician, playwright, epic balladeer and author among the many hats he wears. According to his website, bobbybridgermusic.com, Bridger has performed on “Good Morning America,” National Public Radio, PBS’s “American Experience,” and the A&E network. He also was best friends with Deloria for decades and remains close with Deloria’s family. A few years ago during a break playing a gig, Bridger noticed his son Gabriel and another bandmate — John Inmon, the 2012 Texas Music Awards “Producer of the Year” — were listening to audiobooks and became curious about them. Inmon told Bridger he should make an audio version of his book, “Where the Tall Grass Grows.” Bridger presented the idea to Fulcrum Publishing, which said another of his books, “Buffalo Bill and Sitting Bull: Inventing the Wild West,” might work better because it was considered more commercial. Neither book made it to audio form, but Bridger remained interested in doing audiobooks. He conferred further with Fulcrum, which had published about 35 titles by contemporary indigenous authors, thinkers and philosophers, Bridger said, and were Deloria’s last publisher. Bridger wanted to know why the company had not done more audiobooks and was told that it was a new market and there had not yet been traction on that front. Then, Bridger said a thought came to him in the middle of the night to solve that. “The reason Fulcrum hasn’t gotten any traction is, they haven’t put Babe Ruth in the game,” he said, referring to Deloria. When he brought up doing an audiobook of Deloria’s work to Fulcrum, the company said his connection with Deloria’s family as well as his experience with the recording industry would be key. Bridger spoke with Deloria’s widow, Barb, who was on board. Then, he asked Deloria’s son, Phil, if he wanted to do the audio reading. However, Phil — the first tenured professor for Native American history at Harvard University — said he had too many other projects going to dedicate the time it would take. That’s where another personal connection of Bridger’s came in. The first audiobook is voiced by actor Wes Studi, who has been a regular presence on screens big and small for about 30 years, according to his page on the Internet Movie Database website. Among Studi’s numerous credits — “Avatar,” “Heat,” and “The Last of the Mohicans” being among them — is a role in “Dances With Wolves,” the 1991 Oscar winner for best picture that was filmed in western South Dakota. Bridger said he and Studi have been good friends for years after meeting during a production of “Black Elk Speaks” in Tulsa, Oklahoma, in the 1980s, and was who Bridger turned to for the audiobook. “I called him and he said, 'yeah, let’s do this,' after we talked a little bit,” Bridger said of getting Studi on board. Even for a seasoned performer like Studi, however, the process for bringing a voice to the audiobook proved challenging. Studi had to tackle various accents, personalities and characters — such as Jesuit priests and medicine men — in his reading for the 10-plus-hour audiobook. There also was the matter of none of them having created an audiobook before. And reading Deloria’s work itself was described by Bridger as daunting, given the depth of thought and powerhouse statements that needed reflection. Still, Bridger praised Studi’s work on the project. “It took us about two sessions for Wes to really get a feel for it, and he did a championship job, I’ll tell you,” Bridger said. Bridger said the first audiobook is a way to honor his late friend. And Deloria’s work was a natural selection for the first installment. Deloria’s books compared modern technology to the world indigenous people used to live in and their capabilities as natural scientists. Bridger said Vine was rare in the way he could collect the voices and recollections of medicine men from many regions and analyze that and compare it to quantum physics. “I think we did a wonderful job, but it’s also very timely at this point because, you know, if you really think about it, we’re only one solar flare away from the 12th century,” Bridger said. Getting indigenous philosophy and thinking like Deloria’s into today’s world is important, particularly given recent events, Bridger added. When he watched the events during the Standing Rock protests of the Dakota Access Pipeline, Bridger noted seeing people with placards that quoted Deloria’s books. The goal from here is to get more of Deloria’s books produced in audio form and for the company to become autonomous, Bridger said. He also hopes to get more American Indian people involved immediately. “The World We Used to Live In: Remembering the Powers of the Medicine Men” also uses samples of music from the album “Earth Gift” by Kevin Locke, a Lakota flute player, singer and dancer from Mobridge who was born and raised on the Standing Rock Reservation in South Dakota and earned his master’s in education administration from the University of South Dakota, according to arts.gov. Phil Deloria contributed the audio version of the book’s preface. The audiobook is available for download for $20 at indigenousaudiobooks.com.